Base area lodging. Outdoor hot tubs and saunas. Spectacular mountain views! 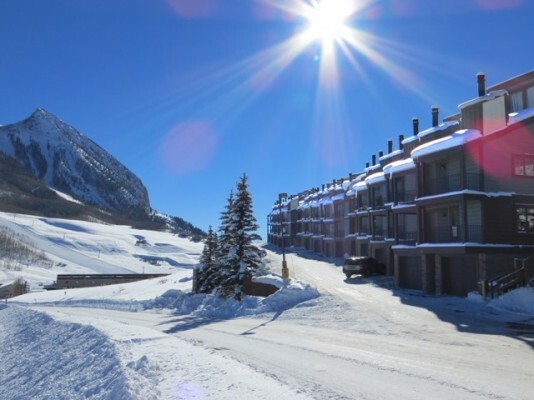 Perched high on a ridge across from Crested Butte Mountain base area, the Eagles Nest townhomes have a spectacular view of the ski runs. Watch the sunrise from living room and master bedroom decks! Each townhome has a fully equipped kitchen, wood burning fireplace, TV with HBO, VCR, wi-fi, laundry room and garage. Floor plans range from one bedroom to three bedroom. Amenities include common area saunas, and two outdoor hot tubs with views of the mountain. Free shuttle to the base area every 30 minutes during the ski season. Ten minute walk to the bus terminal during the summer months. *Townhomes with private deck off master bedroom and living room *Private garage and laundry room *Wood burning fireplace, Cable TV with HBO, wi-fi *Views of Crested Butte Mountain from each townhome *Outdoor hot tub *Quality rated! Gold, Silver, and Bronze available.